Watches are delicate pieces of gadgetry and need to be stored and displayed properly. Keeping them well stored is critical to maintaining and preserving them, since dust or humidity can cause damage to certain timepieces. This is where a watch case comes in handy. If you’re a collector with a weakness for large watches, a good choice can help you both store and display all your watches in the same place, making for easy organisation and protection from exposure to dust build-ups or moisture. Let’s take a look at our top picks for the best watch cases to go for to keep your large watches safe. Large or small, all watches fit beautifully into this case, with 12 roomy compartments containing a plush little cushion each for you to strap your watch around. This helps maintain the shape of leather straps, and keeps metallic straps scratch free, with plenty of room between the compartments and the lid to accommodate your watches separately and safely. The interior of the case is also laid out with smooth bi-cast or PU leather, to add to the luxurious feel of the case and prevent your watches from getting scratched up. The design of the case itself is tough but sophisticated, robust walls with a carbon fiber exterior designed to last for many years on end, metal hinges which let you completely seal the box and its contents off to keep all that dust out, and a glass window in the lid to let this box double as a display case as well as a storage unit. If you’re looking for something a bit more compact, or slightly lower on the price spectrum, this is the option to go for. With half a dozen compartments compared to the full dozen of its bigger counterpart, this case does not skimp on the quality of its predecessor. The case has the same robust carbon fiber design, glass window display and spacious compartments fitted with synthetic leather and a cozy little cushion to tuck your watches around. The black polished leather finish, sleek metallic hinges and the silver brand plaque affixed to the lip of the lid all give this case a classy, elegant feel, and keep your watches well out of harm’s way. 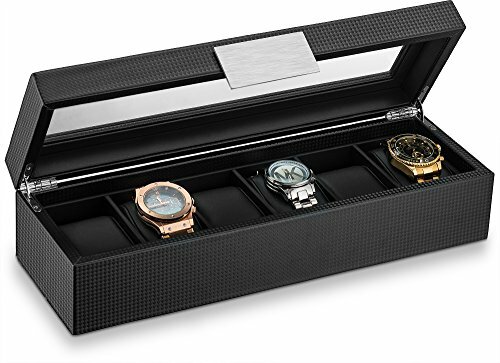 A classy display case inlaid with soft fabric and miniature cushions to keep your watches safe and scratch free, you get 10 spacious compartments ideal for keeping large watches. The cushions bear a white stitched detail to add an extra aesthetic oomph, with a glass lid letting you display your collection while the carbon fiber exterior keeps dust and humidity well out. 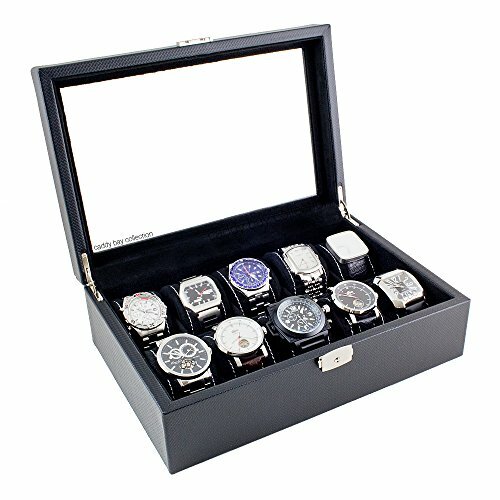 With a metallic clasp to seal the case shut and polished, smooth hinges, this case is big enough to double as both a watch case as well as storage unit for other accessories like cufflinks, as you can simply remove the cushions from compartments you don’t need and use the available space. Each compartment has dimensions of 8.9 cm x 5.4 cm x 7.7 cm, ideal for larger watches. If you are a committed timepiece collector and wish to store your collection together, or are looking for a storage unit to keep your watches together with other accessories, this incredibly elegant, chic display case might be the option for you. A two-tiered display case, the top tier is segmented into 12 compartments, sealed in with a black, glossy piano finish lid and its clear glass window, while the bottom tier is accessed via a smooth slide-out drawer fitted with 10 compartments for larger watches. Both tiers slip shut seamlessly, to keep dust and other harmful rogue elements well away from your watches. Each compartment comes with its own removable cushion to seat your watches on. 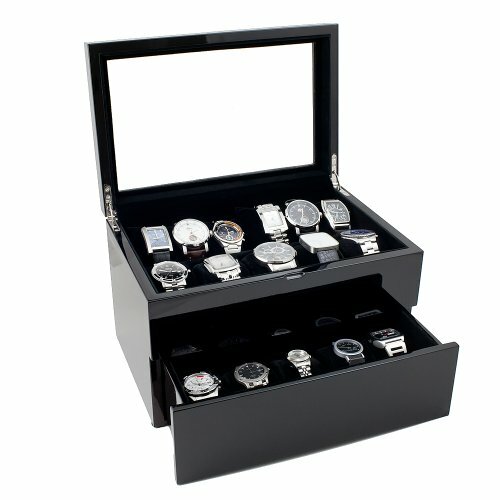 The lustrous black piano finish and silver fittings of the hinges make this sleek case the perfect display unit for your most precious watches or jewellery, making it a stand-out item to have on your dresser or wardrobe as a visually aesthetic piece as well as all-round protection for your watches. Watches are intricate pieces of machinery, their plethora of dials and gears susceptible to damage if too much dust manages to find its way in, or if extreme humid conditions or moisture cause these parts to rust. A simple solution is finding a storage unit to keep them all in – and by storage unit, we don’t mean any old box. 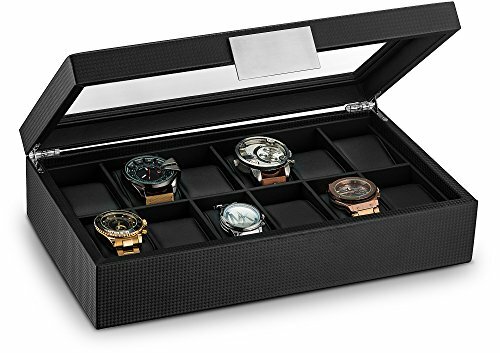 Compartmentalized display or storage cases are our go-to picks – keeping your watches separately rather than all tossed into a single compartment helps keep them free of scratches and clutter-free. Moreover, compartments accompanied by a little cushion to help you maintain the shape of your strap rather than letting the watch awkwardly fold in, and lined with soft fabric or synthetic leather, also helps prevent damages or scratches on your watches. Space isn’t the only concern. While cases with wide enough dimensions to accommodate both large and small watches are highly convenient, the case’s external properties – namely their ability to keep dust and air-borne moisture out – are also important. Sleek cases reinforced with protective carbon fiber are among our top choices for sturdy storage units which promise high durability and longevity, effective in sealing off your watches completely and keeping dirt and humidity out. For an additional aesthetic appeal, options with clear glass windows fitted into the lids let you show off your collection, or simply enhance the visual appeal of the case itself. Cases which come with polished, smooth hinges and statement clasps or plaques win extra points, not only for the luxurious feel they bring to the case but also the extra layer of protection they give your watches.